Estonia’s “national debt” is measured as its “general government debt,” which means the debts of every layer of government. The IMF and the OECD are international bodies that monitor the economies of the world. However, these bodies don’t use the same methods when compiling national debt figures. Some debts of state-owned enterprises and loan guarantees given to other organizations within a nation’s economies are not included as debt by the IMF but are included by the OECD. As a member of the EU, Estonia is also reported on by Eurostat. The Eurostat methods are very close to those of the IMF and they are the same methods used by the government of Estonia itself when calculating national debt. Gross debt measures all of the debts of a government as represented by bank loans and outstanding debt instruments. That means that pension obligations and the debt represented by unpaid invoices are not included. The IMF also publishes net debt figures for the countries that it monitors. These are also expressed as a proportion of GDP. Net debt is the gross debt figure minus the value of the financial assets held by that government. The 2017 net debt to GDP ratio of Estonia was -0.6%. That means that the Estonian government has more assets than debts. 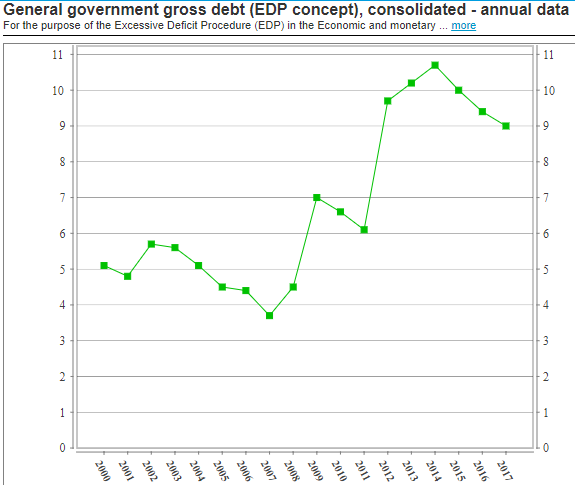 Estonia’s gross debt is very low anyway. That low debt is the result of a government policy of paying back any borrowings as quickly as possible. Is Estonia’s national debt growing? 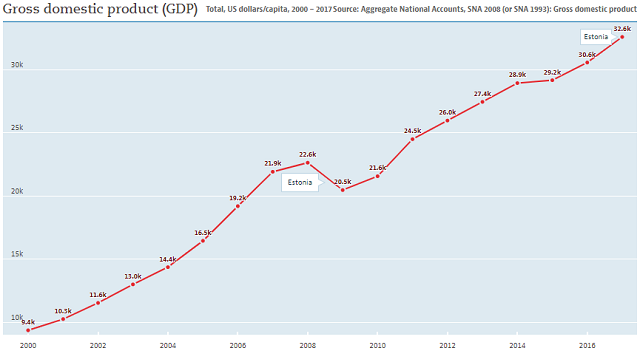 Estonia’s extremely low national debt when expressed as a percentage of GDP is higher now than it was at the beginning of the century. Therefore, the debt of the country has been on an upward trend. However, the increase in the ratio peaked in 2014 and has been falling since. The economy of Estonia has grown every year this century apart from 2009. 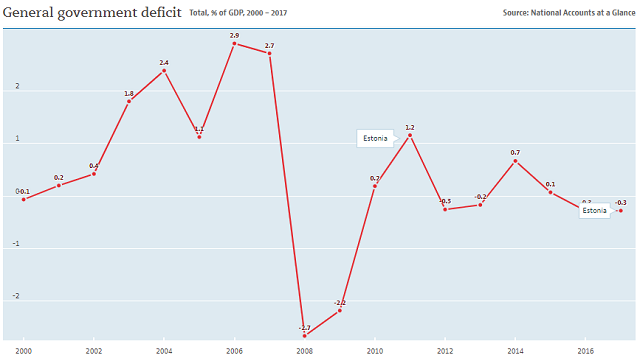 If the government of Estonia continues with its policy of running budget surpluses, or very small deficits, the significance of the country’s national debt will eventually diminish when compared to the nation’s income. For example, the economy of Estonia grew by 6.5% in 2017, as shown in the graph from the OECD below. Such a leap would enable the government to increase borrowing, while still reducing the country’s national debt as a percentage of GDP. However, the Estonian government’s policy of paying back debt as soon as possible means that country’s debt will continue to fall from its 2014 peak very quickly. What is Estonia’s credit rating? The credit rating of a government is very important because a better rating improves trader confidence and reduces the interest that needs to be offered in order to attract buyers of debt instruments. The top credit rating that agencies award is “AAA.” Surprisingly, despite Estonia’s excellent track record in debt management, the country does not have the top rank credit rating. The table below shows the long-term foreign currency credit ratings that the top three agencies award to Estonia. Who manages Estonia’s national debt? The Ministry of Finance (Rahandusministeerium) is responsible for setting the government’s budget and is directly answerable to the country’s parliament. The Ministry gives the task of managing Estonia’s national debt to its State Treasury Department. The State Treasury Department runs accounts for government departments and state agencies. How does the Estonian government raise loans? The State Treasury does not like to raise debt through the sale of traditional debt instruments to the commercial market. This is very unusual. However, the Estonian government became used to getting loans from other governments and international development banks during the early years of its independence from the Soviet Union and became used to this form of borrowing. The 1993 issuance of bonds that raised 300 million Estonian kroons (EUR 19.2 million) for the recapitalization of two state-owned banks. These bonds were all paid off by 2004. The 2004 foreign currency bond issue of 100 million Euros to buy radar systems and pay off existing foreign currency loans. These bonds matured in 2007. Since the above bonds were paid off, the Estonian government has not issued any more. The public servants who manage Estonia’s debt prefer to borrow from the European Investment Bank. This channel of credit gives the government better interest rates on its debt than it would need to offer on bonds that it might issue. The costs of arranging loans from the EIB are minimal and work out a lot cheaper than administering a government securities sales system. The government of the Republic of Estonia needs to borrow very little money. As the graph below shows, the government’s annual budget deficit was greater than one percent of the nation’s GDP for only two years in the current century. In the few years when the government has not run a budget surplus, its deficits have been very small. These small borrowing needs are easier to fulfill with a bank loan than with the issuance of debt instruments. The policy of Estonia’s government is to repay any borrowings as quickly as possible. So, the rigid maturity dates of bonds does not fit with its repayment schedule preferences. The government of Estonia is not only a borrower from EU-linked financial institutions, it is also a creditor to one of them. This is the European Financial Stability Fund, to which all EU members have to give guarantees. Although the government of Estonia has never had to pay out any money to the EFSF, it has had to pledge a guarantee. Even though this is not a debt, those guarantees are counted as part of Estonia’s national debt. The inclusion of this guarantee to the EFSF in the national debt figures of each underwriting county is stipulated by the Maastricht Treaty’s accounting figures. So, the Eurostat-calculated figure of a debt to GDP ratio of 9% at the end of 2017 includes that guarantee to the EFSF. The Estonian guarantee to the EFSF amounts to 22% of the total national debt of the country. With that guarantee stripped out, statisticians are left with the money that Estonia actually owes, which works out a debt to GDP ratio of 7% of GDP. What facts should you know about Estonia's national debt? You could wrap $1 bills around the Earth 10 times with the debt amount. If you lay $1 bills on top of each other they would make a pile 268 km, or 166 miles high.